On a recent Tuesday morning my four year old daughter woke up and promptly announced “I’m bored of staying home and want to go do something today.” As I’m the Stay At Home Dad she knew that would normally be music to my ears. Except that a couple of our normal go-to places (children’s museum and zoo/aquarium) were closed that day of the week. And it was too rainy and chilly for the park. 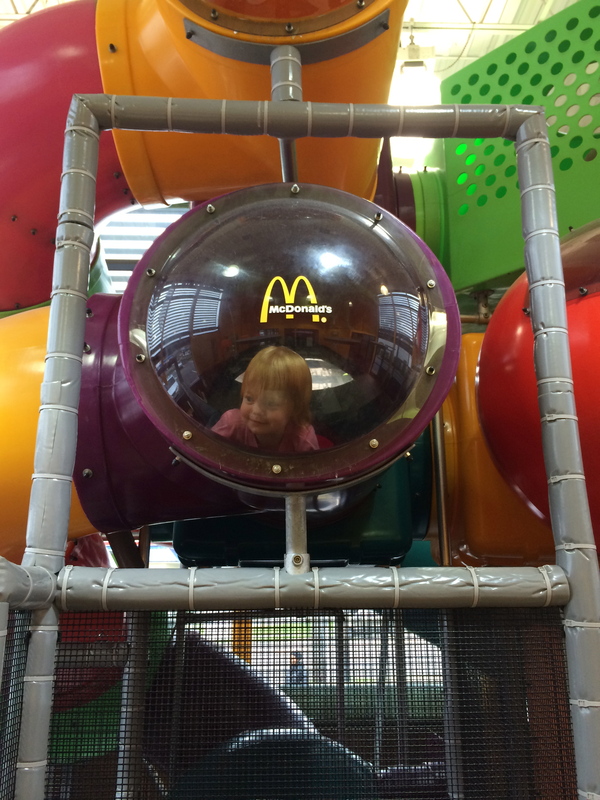 So, I decided that it would be fun to bring the girls (and their 10 year old brother who is homeschooled) to a nearby McDonald’s Indoor Playplace after running a couple errands later that morning. 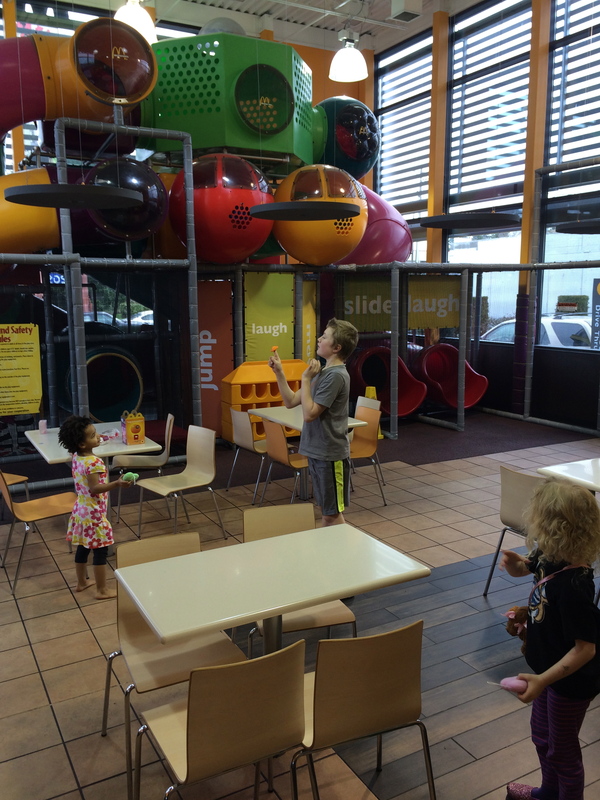 We arrived there just after the noon rush to find about four other families eating and playing. Since my 4 1/2 year old is friendly and not at all shy she immediately found two other girls to play with. My baby was excited to finally be big enough for the play equipment. Without missing a beat Z responded, quite matter-of-factly, “My mommy doesn’t get me any food here. She says I should share with my friends.” I looked up to see her mom sitting at a booth about 20 feet away, completely absorbed in her phone call, as she had been since we had arrived. I noticed that Z was telling me this while she was chewing an apple slice we had “shared” with her. A moment later Z and my daughter bounded off to the play structure and played together some more. Minutes later my daughter announced (rather loudly, I might add) that she had to go potty. I picked up my toddler and held my older daughter’s hand as I opened the door to leave the play area and walk to the restroom. At that point I noticed that Z was trying to tag along to the bathroom with us. Again, as gently as possible, I told Z that she would have to ask her own mommy to take her to the bathroom. I couldn’t do that for her. Of course Z was already through the door, standing barefoot in the busy counter area. Thankfully, she complied and went back to her mom as we continued to the men’s room. As we were entering the stall inside the men’s room Z bounded in the main door to the restroom, followed by her mother. Still on her phone. In the men’s room! After passing the urinals she finally realized her error and exclaimed that they were in the men’s room and needed to leave. I chuckled a little bit at the absurdity of the situation. Judging her just a little bit as a bad parent. Me: Hi. It appears our daughters are hitting it off pretty well. I just wanted to let you know about something that happened earlier. Your daughter asked to share some of my daughters’ food but I didn’t know if that would be okay with you. Her: That’s fine. She can have anything. Me: Oh. Well, she had an apple slice or two. But she appeared to still be hungry. Would it be okay if I got her something more to eat? Maybe a Happy Meal or something? Her: Yeah. That would be great. Me: Would you like anything? At that moment I realized how wrong I had been to judge this mom. I didn’t know her or her situation. We just happened to be there at the same time with our children. Maybe my purpose in being there at that time on that day wasn’t to be a judgy sanctimonious jerk but rather to do something nice for that little girl and her mom. 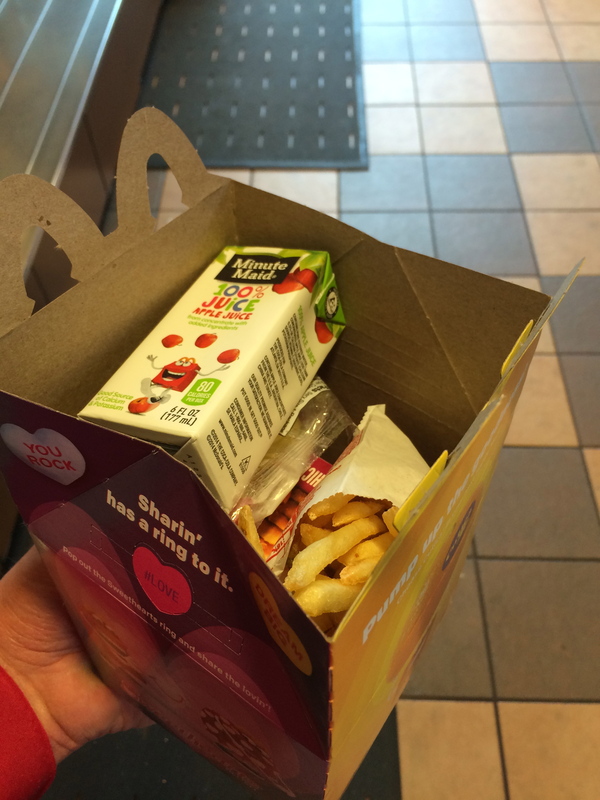 I contemplated that as I walked to the counter to order a six piece chicken nuggets Happy Meal for little Z. After a few short minutes I brought the food back into the play area and handed it to the mom. She smiled at me and asked if we came there often, making an effort to have a conversation. We talked a bit more and she told me that they came to McDonald’s almost every day after her daughter was done with school since it’s only a few blocks away from her school. Then Z came over to eat her meal and asked her mom where the food came from. Her mom told her that I had gotten it for her and asked her daughter to thank me. After a few moments of hesitation she did as her mother had requested. My daughter asked me why I had gotten Z her own Happy Meal and I told her, simply, that Z seemed hungry and it was a nice thing to do for her. She was satisfied with that answer and happily played with her new friend once she had finished her food. As we got ready to leave my daughter gave Z a hug goodbye and said, as only she can, “Bye, friend. Hope to see you again!”. Reflecting on that day almost a week later I’m bothered by how easily I started to judge this mom and her child. I’m sure we all do it every day. I know that I do. I also know that I shouldn’t. Instead of judging I’m going to try to be more compassionate and understanding of what others are going through. After all, that’s what I hope my children will do when they meet others. If I don’t do it, how can I possibly expect it of them? Thanks for the lesson, McDonald’s. I’m lovin’ it! Great read! You’re right, we’re so quick to judge people and so slow to show them compassion. Thanks for the reminder.